So I've been making terrariums. I got all kinds of mosses, couple ferns, lichens, rocks, mossy rocks, wood, mossy/lichen-y wood etc. So far I made two forest themed terrariums and one desert terrarium with dwarf cacti and a mini aloe. I am thinking about doing a beach theme next. The pics don't do them justice they look way better in person. Anyway, enjoy! Re: Check out my terrariums! Those are cool. That first one looks like a mini forest. My daughter makes moss gardens. I'll try to post some pics tomorrow! I always feel a sense of serenity whenever I see a terrarium. I'm lovin the first one also. Who am I kidding! I like them all PunkRotten. They look very pretty in the vases. I've never done a terrarium, so I'm just curious -- you don't need to cover the vases to hold humidity in? FUN!! I haven't played with terrariums in a long time, but they were one of my first experiments and I had a bunch of them going for a while. rainbowgardener wrote: They look very pretty in the vases. You can, but it doesn't matter that much. The most moisture loving plants like the mosses and ferns can be covered more than other terrarium plants. Overwatering is the biggest killer of terrariums. So I am being very careful about it. Here's two new ones and better pictures of the previous ones. BTW, the bottom four pics are the two new ones. Nice terrariums! I love the skull with the horns. You have a good eye for tasteful arrangements. Since they are so narrow it is hard to get in them. You also have limits to what plants, rocks, and wood you can use because of the space. I want to get a container that is much wider but they can be pricey. I may do more thrift shop hunting. I got all those vases/containers for 50 cents each. I got about 10 more containers and plan to use them all. I want to make different themes. I need to do a beach theme and maybe even a riparium or mini pond. 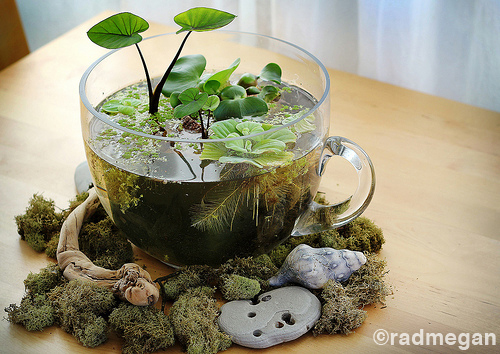 I seen someone do one with a mini taro and some floating plants like frogbit and mini water lettuce. You've made so many! Are you selling them? I recognized the vases as typical style for gift fresh flowers. I've seen a bunch of them even offered free on Craigslist. And someone probably not more than 15 min drive away is offering a large -- 12"? -- round/nearly spherical glass bowl for a bit of $. I think It was for $10-15 in fall which I successfully resisted, but apparently no takers then, because it's up again for $6 or something this time. I have to chant to myself -- "I don't have room for terrariums ..."-- about 50 times every time I see that, and you are NOT helping by posting these fun creations. I think of these more as dish gardens. I am used to terrariums having a dome and a more closed system. But, whatever it is called, they are beautiful. applestar wrote: You've made so many! Are you selling them? Yes, I may sell some. But I like them all so it would be hard to decide which ones I will let go. I got a few other "plant art" ideas too. I got a bunch more plants coming in too such as staghorn fern, pygmy sundews, sinningia pusilla and a few others.